Animal cruelty? Does the dog like it? It's hard to say, but let's not let that sticky debate get in the way of the fact that this is undeniably awesome. 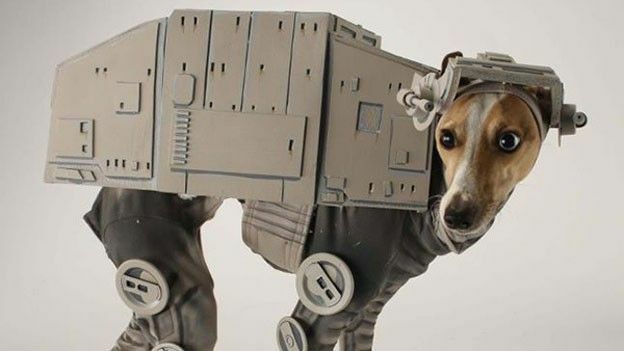 The maker gets bonus points for the fact that it's a particularly weedy looking dog, a fact which only adds to the ridiculousness of trying to turn it into a walking tank. When you've got a name like Willard Wigan, you know you're destined for greater things than the common man. This particular WW has decided to dedicate his life to making micro-sculptures, most recently turning his hand to a version of the Parrot AR Drone. And it's damn tiny. And made of gold. Chances of it actually flying? Slim. It's mad to think that graphical processing power of the PS2 now fits into our pockets. When Sony's second console came out it seemed to be the pinnacle of virtual realism. Now Rockstar's upset that myth by cramming the first fully 3D GTA game into dual-core Android and iOS devices. Smash hit hack-em-up iPhone game Infinity Blade pushes the iPhone to its graphical limits, which is probably why it doesn't look out of place in an arcade. Meet Infinity Blade FX – a 46-inch humungo-version. It keeps all the same touchscreen controls as those found on the original. Just… you know… bigger. Android owners with megalomania complexes need look no further than the new CERN-approved app for the Large Hadron Collider. The app provides users with an endless stream of info and facts, but doesn't, in this incarnation at least, let you control the thing. That's not to say, though, that you can't try opening a black hole if you've rooted your phone. Wanna watch the dullest game of table tennis you've ever seen? We'd recommend you watch two robots go at it. The Chinese have developed the bots to be the ultimate in ping pong machinery, but the result is that they just hit it back and forth between each other along the exact same line at a pretty safe speed, meaning no one will ever win. It's not exactly Real Steel.